Sooner or later Fox will need his own room, right? So we'll put him in the room that was our bedroom until the latest switch-a-roo. Though the room currently holds dismantled printers, out of season clothes, and an inordinate amount of fabric, one day soon we'll whip it back into shape and make it suitable for The Boy. The existing wall color is Sherwin Williams Fawn Brindle. It needs another coat, but nothing major. I plan on making the crib skirt out of a gray and white ikat fabric, them using the extra strips to embellish the curtains and to make tie backs for them. 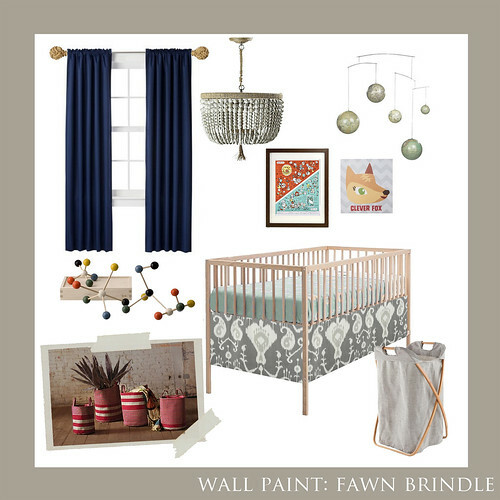 Items we already own: Navy blackout curtains (from Target), globe mobile (clearance from Restoration Hardware years ago), red striped storage buckets (from red envelope), Brainstorm biology print, Clever Fox wall art (a gift from my cousin, from Target). Love it. Boyish without being trite.